The late TV painter known for his soft voice and reassuring attitude has become a cult hero. His painting videos fill people with a sense of happiness and calm as Ross paints a nature landscape filled with happy little trees and wispy clouds. He passed away in 1995 but his legend lives on through YouTube videos of his TV program and an audio recording of his voice that people use to help them sleep. Now JrSpeedyXx has come up with another way to keep his legend going strong. A full Fortnite skin concept with an easel glider, paintbrush pickaxe and color palette backbling. If Fortnite added this they honestly wouldn’t be able to take my money fast enough. 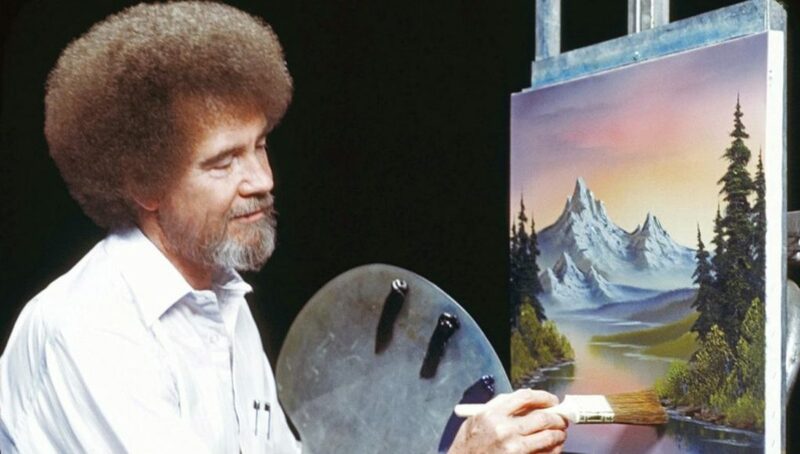 If they added a spray of a happy little tree I would just go around painting the map in a way that made Ross proud. In the comment section of that post, other people suggested some solid changes. When another commenter questioned how “yoked” Ross was, VANY11A responded that was accurate as he spent 20 years in the military before sitting behind an easel. After enlisting at the age of 18 Ross eventually rose to the rank of Master Sergeant. Once leaving the military he vowed to never yell or raise his voice again. There are a lot of legal complications that would make this skin effectively impossible to actually put in the game, but its fun to imagine.